With the recent success of Britain's cyclists on the world stage in events such as the Tour de France and the Olympic Games, the UK has established itself as one of the globe's great cycling nations. Although this has not always been the case and cycling infrastructure in Britain has often left a lot to be desired, massive improvements have taken place in recent years. Once you are out in the countryside, Britain offers some superb routes for cyclists of all kinds, whether you prefer rolling roads or tough trails. When cycling in the south of England, the South Downs is a great area to opt for. Within accessible reach of nearby hotels in Brighton, the National park offers routes that take cyclists past some of the region's main landmarks. Cycling on the South Downs Way is highly recommended, although some sections along it require good fitness and a decent mountain bike. A good route runs some 24 miles from the cathedral city of Winchester to Buriton. The route heads past Beacon Hill, a great vantage point for views of the surrounding countryside, which is also a nature reserve. 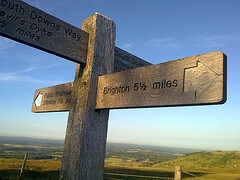 Butser Hill, the highest point on the South Downs, is also passed by the route, while there are several pubs to enjoy in villages such as Exton. You can also make overnight stays in some of the villages along the way, which takes you through picture book English countryside. A different kind of English countryside can be experienced in Yorkshire, with the Yorkshire Dales National Park offering some superb scenery and great cycling. Although accessible for visitors from York, the National Park is more easily accessed if you are in Leeds. A great route to choose in this part of Yorkshire begins in Skipton and takes you on a circular journey through the rugged moorland and picturesque villages of this beautiful part of the north of England. 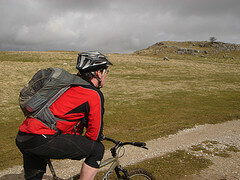 The route encompasses the woods of Wharfedale and the cliff of Malham Cove. The town of Settle is also well worth a stop-off, especially as some of the climbs in this part of the world can be steep and you will need good levels of fitness to cycle in the Dales. After the moors of Askrigg Common, the descending road into Swaledale will have the hairs on the back of your neck standing on end, as it is just so beautiful. With plenty of villages to explore along the way, with many pubs serving localled brewed ale, the Dales is a top destination for cyclists. South East Scotland and the Northumbrian coastline are also well worth the attention of cyclists. 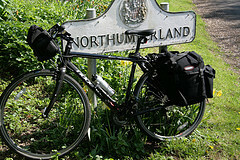 Beginning the route in Newcastle in Northumberland, you can cycle north, crossing the Border with Scotland, to finish near Edinburgh. Highlights in this part of the world include Hadrian's Wall and many other castles and towers. This region was the home of the Border Reivers, mounted cattle rustlers and criminals who rode in the late Middle Ages and at quiet moments, in an evening on a quiet road, you may still catch echoes of their hoof beats across the misty hills. Travelling from south to north is advisable because of the often stiff prevailing winds in the area. Your efforts will be rewarded with some superb sea views at places such as Eyemouth. The magical isle of Lindisfarne, with its ruined abbey, is also good for a stop off, not least because of the boat trips to the nearby Farn Islands, with their seals and sea birds. With plenty of rolling roads, you will need some good fitness levels for this trip. On the other side of Britain, the Lake District is the home of England's highest peaks and some of its most spectacular scenery. 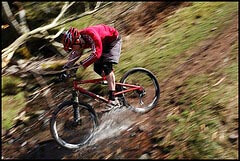 Mountain bikers can find plenty here to keep them occupied, with great routes to explore in Grizedale Forest and elsewhere. Road cyclists will find some of the quietest roads in the UK at the right times, although Bank Holidays can make for busier times. Hills and mountains are what you come to Cumbria for, so be prepared to test your legs on some of the most beautiful, but testing, routes in Britain. Heading back south along the west coast, we come to Bath and the south west of England, another region where the opportunities to enjoy both road cycling and mountain biking are plentiful. The city is handily situated to base yourself for a cycling tour of the region, with accommodation options in Bath available to suit all budgets, with its pretty Georgian architecture and ancient Roman ruins. The county of Somerset is a green and pleasant land, full of cider orchards and lovely quiet roads. The Colliers Way route from Bath stretches over 23 rolling miles of countryside and can form a good basis of your exploration. You can also cycle the 13 miles to Bristol along the Bristol and Bath Railway Path. With superb countryside and interesting rolling routes, cycling in the UK offers thousands of stimulating possibilities. Get you bike out and start planning and training for a trip today. Last updated by jack on 23 September, 2012 in Travel. Fab route tips on cycling around the UK!